Best part of using teak wood in furniture making is that it has got a natural quality of self protection. Oil that is natural in teak makes it ideal for outdoor furniture and when used indoor, it will not be subjected to decay easily. In addition, teak is one of the most elegant woods for furniture making. At the same time it is also durable that makes it most popular among home owners and makers, as well as in the commercial circles. 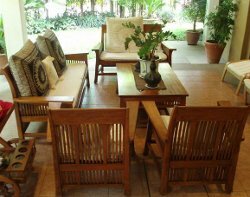 As already said, with a little care and maintenance teak furniture will gain very long life. Just use a bucket, liquid or mild soap, white vinegar, sponge, towels, plastic tarps, and water hose and get going. Steps in cleaning the teak furniture are as follows. Add ΒΌ tea spoon of liquid or mild soap. Vinegar can be used to remove mold or mildew. Addition of vinegar will also help removal of musty odors. Cleaning should only be taken up on a sunny and warm day. Placing a plastic tarp the teak furniture should be placed on it for cleaning. Submerging a piece of sponge in the liquid soap or mixture gently scrubbing the teak furniture will help. Soft scrubbing can be continued till the teak furniture takes a glazed look. The soap solution can be removed from the teak furniture by spraying water from a hose. Finally the furniture should be dried up using a clean towel.